Although, it’s certainly possible you haven’t yet heard of her…because as it turns out, Adelaide isn’t real. She was created as a fictional character by the creative team at NINE dot ARTS as we curated the hotel’s extensive art collection. By creating a richly-textured muse who represents a fully-lived life, we were able to curate an authentic collection that contributes to the hotel’s refreshing take on luxury. The story of Adelaide is a vivid reflection of NINE dot ARTS’ uniquely-tailored approach to curating inspiring art collections that tell a story. 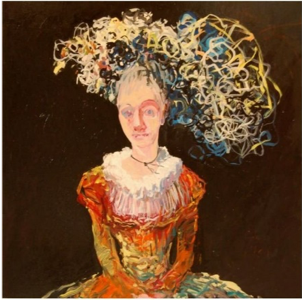 Leveraging the story of Adelaide to develop an authentic collection from the perspective of a single collector has translated into a one-of-a-kind opportunity to transform how people will experience the art. In total, the collection features 3,600 unique objects and antiques, more than 1,200 total artworks, and more than 175 original artworks including one work by Paul Gauguin alongside 81 artists with ties to the Savannah College of Art and Design. As part of fully telling the story behind the art and our muse, we also crafted a narrative about what the work meant to Adelaide personally. Below, we’re highlighting how we thoughtfully incorporated the artist for the piece into the narrative to create a truly unique and compelling experience. This piece spoke to me immediately. 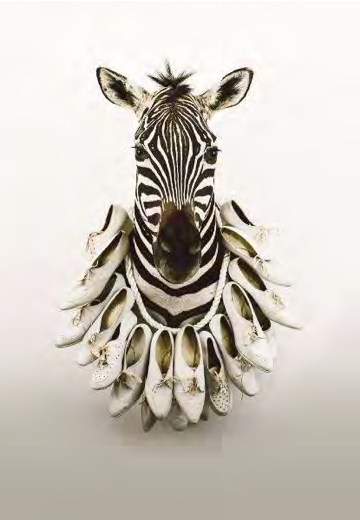 I was struck by the beauty of the zebra and the simple, monochromatic pattern of the shoes around his neck. However, the work itself kept pulling me back because I knew there was symbolism behind those shoes. The artist says, “As her role in society has evolved, so have her career and footwear choices. Once upon a time, if the nursing shoe fitted, she would just have to grin and wear it.” I have witnessed these changes in women’s lives firsthand, from growing up in the 50s and 60s to today, when the role of women is ever-changing while our voice becomes stronger. It is a remarkable thing to witness and be a part of as a woman, and I love that this piece wraps it all up with its unassuming beauty. My mother’s family had a tradition of commissioning portraits of the bride for wedding gifts. Once I moved back home to help my parents, my mother would sigh and wonder aloud when my time for a sitting would come. I decided to take fate into my own hands. That Christmas I commissioned a young artist I’d met in Bushwick, Deborah Brown, to create this piece as a gift for my mother. Deborah has a way of scrambling past and present, reality and imagination that I adore. She saw in me not only a kind of reserved resignation but also a patient strength, a contained energy. I hung it on the mantel after my parents had gone to bed with a big, red, velvet bow. The next morning, my mother held my face between her hands and said with a smile, “I’ve always thought you’re perfect as you are my sweet girl.” Whenever I see the piece, I’m filled with the same warmth and love as on that Christmas morning. Like most multi-generation families in Savannah, I have oodles of family photographs in shoe boxes, drawers, and albums. I wanted to pay homage to my ancestors but didn’t know how to do that until I met Michael in Florence. I saw him drawing these energetic, fanciful portraits in the Piazza della Signoria and knew he was someone with whom I had to speak. His warmth and humility instantly drew me in, and I knew he could breathe new life into these images, reanimate the faces with vigor, zest and personality. 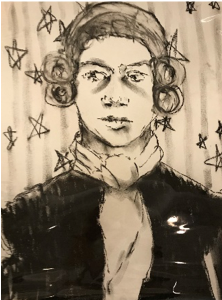 Michael gives each portrait a new narrative, one I can find my way into over and over with their bizarre accoutrements, quizzical expressions, and gestural linework. I love his imaginative interpretations: a dove-eyed woman, a net of stars in the background, a brocade-patterned face. There’s a magical quality to these spritely portraits that delights me time and again. I was in Miami last year for the PULSE Contemporary Art Fair where I met Donna Ruff and fell in love with her cut newspaper pieces. Our conversation was so rich that by the end of it, I just had to have one of her pieces. She explained that she has always read the New York Times (as have I) no matter where she has lived. She likes to explore patterns and pattern-making in her art. One day, she saw a pile of her old newspapers and decided to take them to her studio. 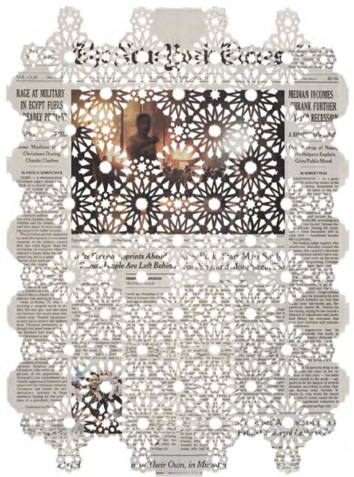 She began cutting these gorgeous patterns right into the newspaper itself. I love all the contradictions within these pieces. They are destructive with cutting away patterns, yet constructive, creating something new. Your eye is attracted to the negative space of what’s been removed while simultaneously drawn to the parts of the newspaper that are intentionally left. Many of the newspaper stories Donna chooses have to do with women and children and the refugees in Europe (like this piece). She leaves what she wants you to see: an image of a child or a potent headline. Donna describes how ephemeral a newspaper is, as well as the fleeting nature of news, especially these days with the media bouncing from one story to the next. Her art is a way of preserving history by making it into something beautiful. Marcus Kenney was a young student studying photography at SCAD in the late 199s when I first met him. I was so enthralled with his work that I invited him to display his collection in my home so I could introduce him to all my friends upon his graduation in 1998. It has been a joy getting to know Marcus and watching him grow as an artist and person since then. This recent piece is one of my favorites. Marcus told me that his mother called him (and still does call him), “Little Boy Blue,” which is so sweet and endearing. And his son plays the trumpet, packing this little boy sitting on the edge of the world full of meaning and nostalgia. 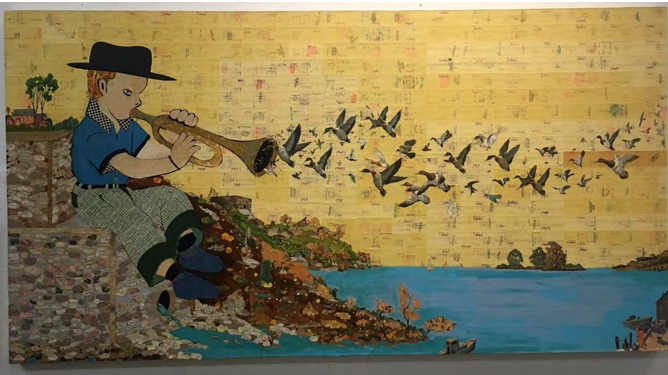 I am fascinated by the birds – ducks are a prominent, recurring motif in much of Marcus’ work – as they are flying into the trumpet, instead of away, the opposite of what your mind thinks when you first glance at this piece. I really love the tiny figures throughout the piece. They are beautiful and each have their own story. My favorite is the little girl in the bottom right, as she reminds me of my brother and me spending the long, hot summer days of our childhood crabbing and fishing off the wharf of our family’s summer home on Tybee Island. What I love most about this piece are all the gorgeous details available to discover and the infinite opportunities the viewer has to let their mind wander and create stories and relive memories – and the possibilities to return to the piece over and over and be swept away into a new story each time. 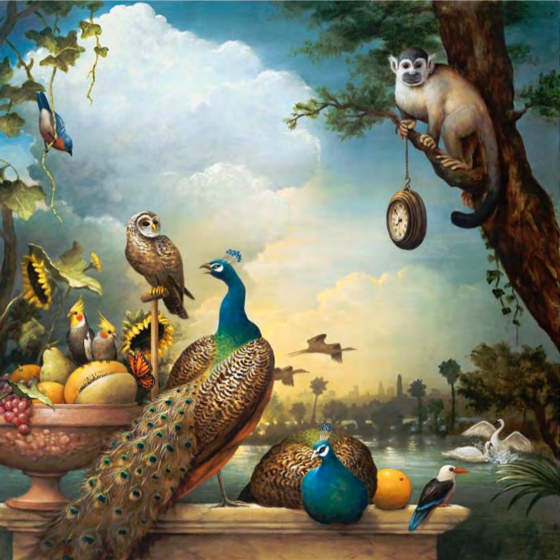 Kevin Sloan’s art is fascinating as it pulls you into these lovely, surreal little worlds that present more questions than answers. I was originally drawn to this painting because I adore peacocks, but then was intrigued by the beautiful details and the seductive symbolism. I love how Kevin plays with the relationship between nature and modern reality. The lushness and theatricality are meant to ask questions and start conversations about the role of nature in our modern, technological and always-changing world. I pondered this recently as I approach the end of my life and want to slow down, yet our world seems to be rushing and running from one thing to the next. I hope to savor the beauty in the details of nature and my life, especially now, and live in the moment.